What I didn’t fully grasp when my mom passed away the day after Christmas was that I wasn’t just losing her, I was losing her cooking, too. Mom was known for a lot of great cooking. She made the best dinner rolls of anyone I know. Her lasagna was famous among her family and friends. She had a knack for pie crust, and made a mean spaghetti sauce. But what I will miss the most is her beef stew. Mom made a great beef stew. She made it with tender chunks of beef, large chunks of potatoes, and a colorful mix of vegetables. The best part was the thick beef gravy that everything was swimming in. It was my favorite childhood food, and I still asked her to make it most years on my birthday. The last time I had my mom’s beef stew was camping with my parents in October. It was a beautiful sunny weekend, but a little cold. Mom’s beef stew made a great belly warmer at dinner. I didn’t know it would be the last time I ever had it. Many of my mom’s recipes are captured in various family cookbook compilations. I am forever grateful to my sister for the family cookbook project she spearheaded a few years back. In addition to other family favorites like Grammy’s Christmas pie and Grampa Joe’s soup, Christine preserved for posterity some of Mom’s best dishes, including her dinner rolls, lasagna, and seafood linguine. While no one will ever be able to make these dishes with Mom’s exact touch, at least we have the recipes. We didn’t have the recipe for beef stew. 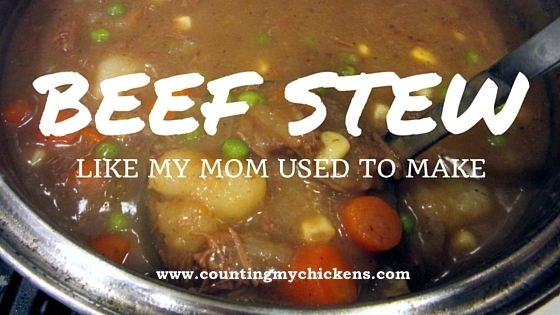 Mom made beef stew so many times that she didn’t use a recipe. No one ever asked her to write it down. I didn’t realize this error until after she was gone. I even had a dream about it one night. I asked my sister if she had the recipe and she told me to ask mom. In my dream, Mom was in the next room, and all I had to do was go ask. But I woke up before I got to her. My dad and I, both missing Mom’s beef stew, decided to try to recreate the recipe one day. We both had watched her make it enough over the last fifty years that we pretty much knew what was in it. Dad lined up all the ingredients. We just had to figure out how she put it all together. Like my sister suggested in my dream, all I had to do was ask. 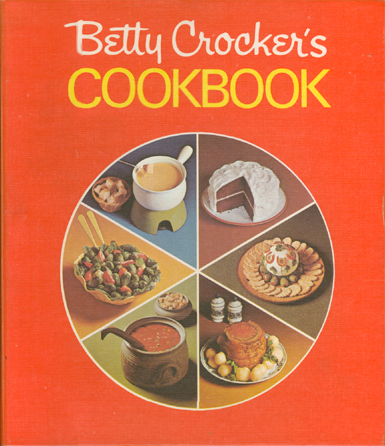 Surveying my mother’s collection of recipe books, I found a tattered copy of Betty Crocker’s Cookbook, a staple in 1970s American kitchens and recognizable by its iconic “red pie” photo collage on the front cover. Mom’s hardcover, 1969 first edition was so well-used that it was missing a spine and was held together by a strip of packing tape. It has been in her kitchen for as long as I could remember. It had to be the place to find the inspiration for my mom’s take on beef stew. On page 398, I found a recipe for “Old-Fashioned Beef Stew.” While it wasn’t quite what Mom made – she never used turnip or green pepper, for example – it seemed pretty darn close. In the end, we were rewarded with a big pot of beef stew that was about as close to Mom’s as we could have hoped. I’m sharing our recipe here as a tribute to my mom and all the fabulous meals she cooked for her family over the years. Mix flour, salt and pepper in shallow baking dish. Dredge meat in flour mixture until it is evenly coated. Shake off excess flour. Heat oil in large, heavy soup pot over medium heat. Working in batches, add beef in single layer and brown thoroughly. Remove beef and deglaze pot with red wine. Return beef to pot. Add beef stock and water and bring to a boil. Reduce heat, cover tightly, and simmer for two hours. Stir in potatoes, carrots, celery, and onion, and simmer for 30 minutes more until vegetables are tender. Stir in peas and corn and simmer another 5 minutes. Add cold water and flour to small jar and cover tightly. Shake vigorously until blended. Stir mixture into stew and bring to a boil, stirring constantly. Boil and stir one minute or until gravy thickens. 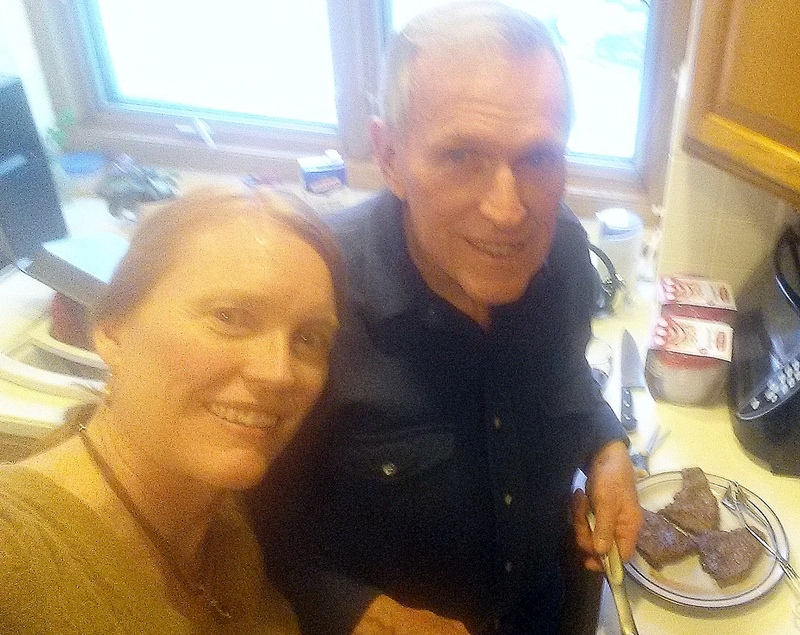 A blurry picture of my dad and me on cooking day. 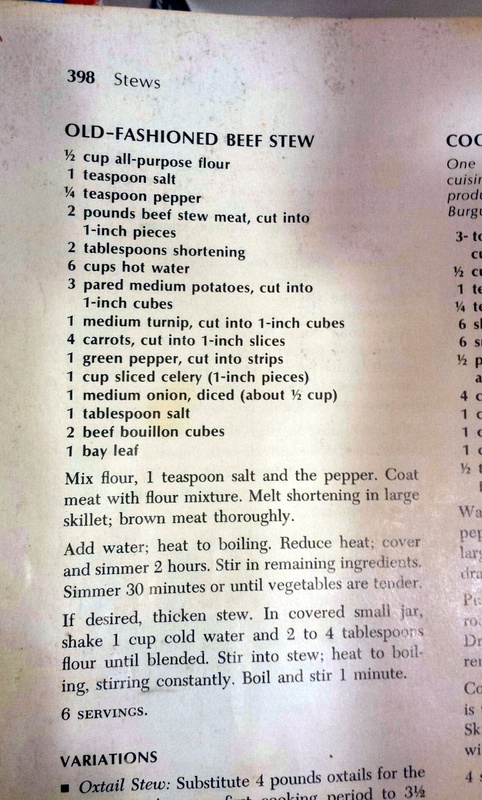 This entry was posted in Cooking with Garden Produce and tagged beef stew, dad, home cooking, mom, recipe by Deborah Neyens. Bookmark the permalink.